Hazel Waters did not appear in court this morning and the case was pushed back until next month. 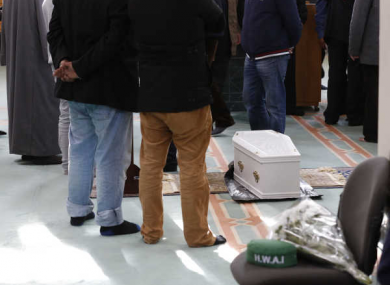 The funeral of the two year old earlier this week. THE MOTHER OF toddler Hassan Khan, who was found dead in an apartment in Ballybrack, south Dublin on Thursday last, was unable to appear in court in Dublin this morning as scheduled as she’s receiving medical treatment in the Central Mental Hospital. Hazel Waters, 46, with an address at Ridge Hall in Ballybrack, had appeared before a brief sitting at the Criminal Courts of Justice at the weekend, charged with the murder of Muhammad Hassan Khan sometime between 15 and 16 October. She was arrested on Friday night at 10.30pm at Dun Laoghaire Garda Station and charged 20 minutes later. The court heard on Saturday that she made no reply when charged. Her solicitor told the court at that appearance that his client was asking not to be psychiatrically assessed — but asked that the authorities make their own assessment of her in custody. However, in Court 3 at the Criminal Courts of Justice this morning, Garda Sergeant Joseph O’Hara said that she was unable to attend today as she was receiving treatment at the Central Mental Hospital in Dundrum. Her appearance has been put back by two weeks. She is now due to appear on 5 November, in the same court. Email “Mother charged with toddler's murder admitted to Central Mental Hospital”. Feedback on “Mother charged with toddler's murder admitted to Central Mental Hospital”.